Entry-Level Costco Pay is Going Up! Will You Apply? We’re big fans of Costco when it comes to saving money — but what about when it comes to earning money? Turns out, it might be helpful there, too. The wholesale retailer just decided to raise its entry-level wages, The Seattle Times reports. This is big news, because although Costco reviews its pay scales every three years, it hasn’t raised its entry-level wages since 2007. When you see how much you could earn, you might be tempted to apply. How Much is Entry-Level Costco Pay? Costco’s current entry-level wage in the U.S. and Canada is $11.50 to $12 per hour, according to The Seattle Times. But starting this month, it will increase to $13 to $13.50 per hour. For an entry-level position, that’s pretty awesome. To put it in perspective, it’s more than 30% greater than Walmart’s starting wage of $10 per hour, or BJ’s $9 per hour. Plus, the majority of Costco employees quickly move beyond that pay. “About 60 to 65 percent of Costco’s employees make top-scale wages, which are in the $23 range,” Costco’s chief financial officer Richard Galanti told The Seattle Times. And the journey from entry level to top level is fairly short: around 4.5 years, according to Galenti. Starting at $13 per hour is already pretty good — and moving to $23 per hour within five years? We’d say that’s a career path worth checking out. Click here to learn about open jobs at Costco. 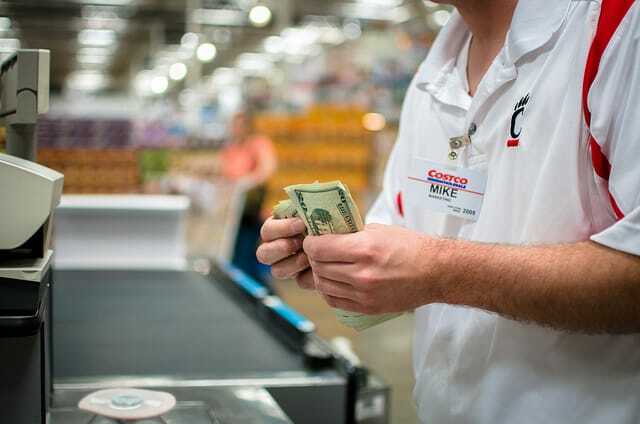 Your Turn: Are you surprised by how much Costco employees earn? Would you work there?